When it comes to business fraud, small businesses carry the biggest burden - their losses have a bigger impact on their bottom line and they make an easier target than larger corporations. We specialize in helping reduce your risk of victimization and uncover suspicious activities sooner, without adding to your staff or infrastructure. Billing Fraud: Our cloud-based bill payment system includes scanned images with every transaction, procurement and accounts receivable review. Check Tampering: With role-based approval processes and automated electronic payments, you’ll never have to worry about paper checks getting into the wrong hands. Skimming: The only sure-fire way to prevent skimming is to eliminate cash coming into your office. We help you avoid falling victim to skimming schemes by taking control of your accounts receivable and removing the need for having money come directly into your business. Data Theft: Data is more likely to be lost through theft or hardware failure when stored locally. GrowthForce helps protect your business from data theft or loss by hosting your financial information in a secure, cloud based environment to ensure your data is secure, accessible, backed up and protected. 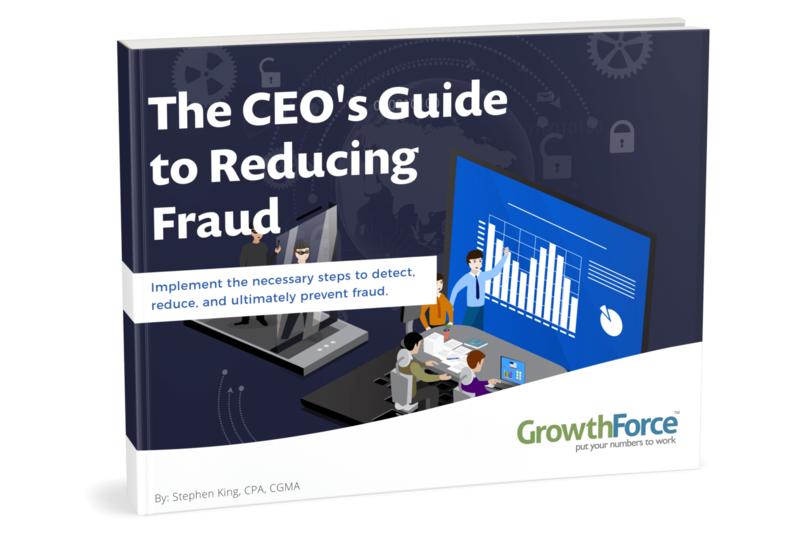 Download The CEO’s Guide to Reducing Fraud, to help you understand how to implement the necessary steps to detect, reduce, and ultimately prevent fraud.